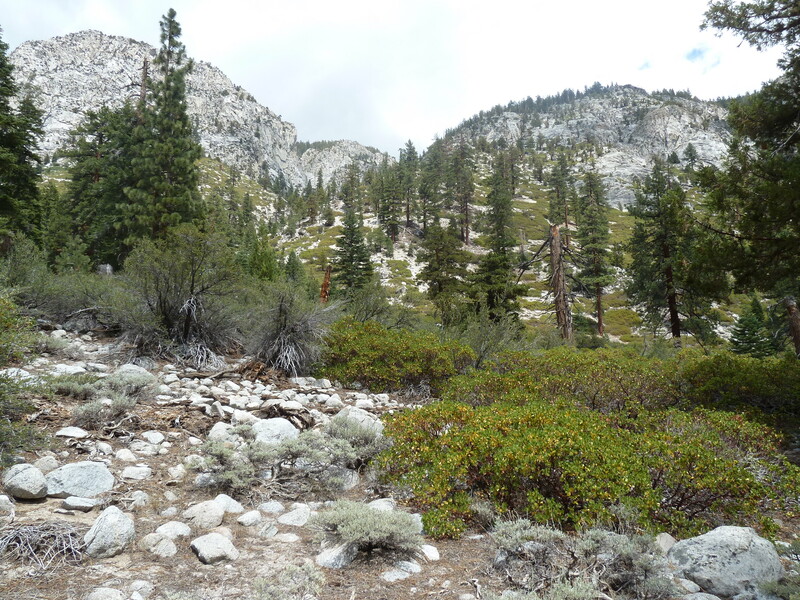 In mid-July, 2014, I hiked from Mineral King to Whitney Portal, and explored a route up Whitney Creek from the Kern River to Crabtree Meadow and the Pacific Crest Trail (PCT). 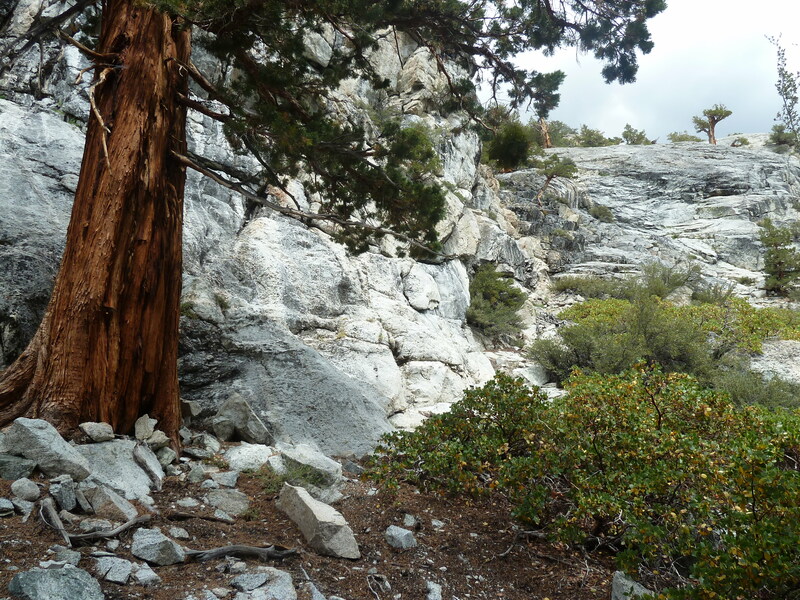 I had seen some forum discussion some years ago (here: Kern Short cuts, and here: Hiking up Whitney Creek from Kern to Crabtree) about rangers and others taking a shortcut, so I wanted to see how difficult it might be. 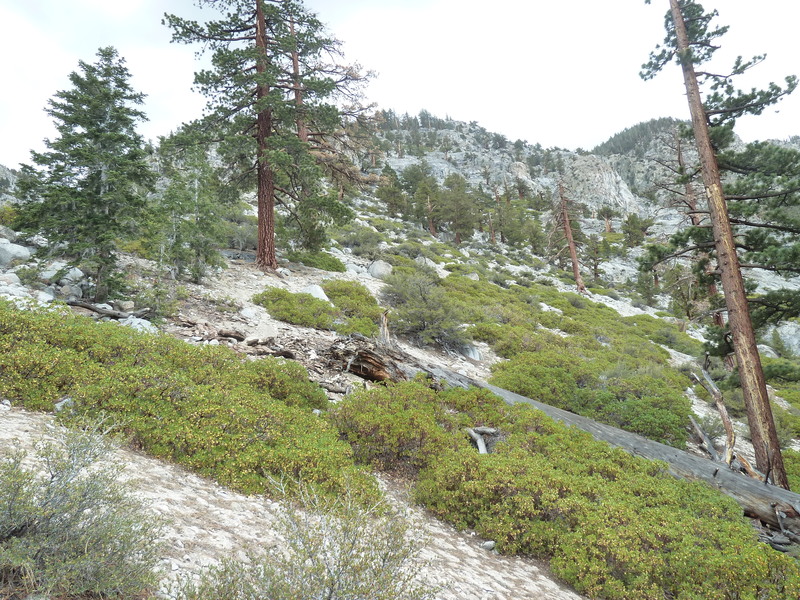 In summary, it is a climb of 2500' (800m) over about 3 miles, and cuts off about 12 miles of the High Sierra Trail (HST). In the lower section, there is a minor bit of walking through bushes, and mid-way, a steep granite ramp section climbing 300' requiring using your hands a few places (class 3). But overall, it was pretty easy. The hike between the HST and the PCT trails took under 5 hours, and I wasn't hurrying. I talked with Ranger Rob Pilewski at the Crabtree R.S. and he mentioned a route through some willows. I am sure this is a different route. I think his route followed the creek closely, while my route stayed well away from the creek, until reaching gentle terrain on the last mile of the route. Interactive Gmap4 map of the route (Supports both topo (t4) and Google Satellite views) Note: the 11 eastern points are taken from Google Earth, which shows a trail between the Packer Camp and the PCT/Crabtree junction. There is no trail, but it was a use trail in the past. Here is a Google Earth view showing the HST at the bottom, and the JMT and PCT at the top. The yellow GPS points show the route up to the horse-packer camp. 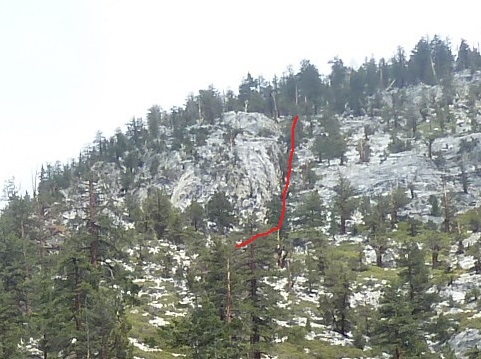 Note the red line spur extending down from the PCT. It shows up in Google Earth, but not on other maps. 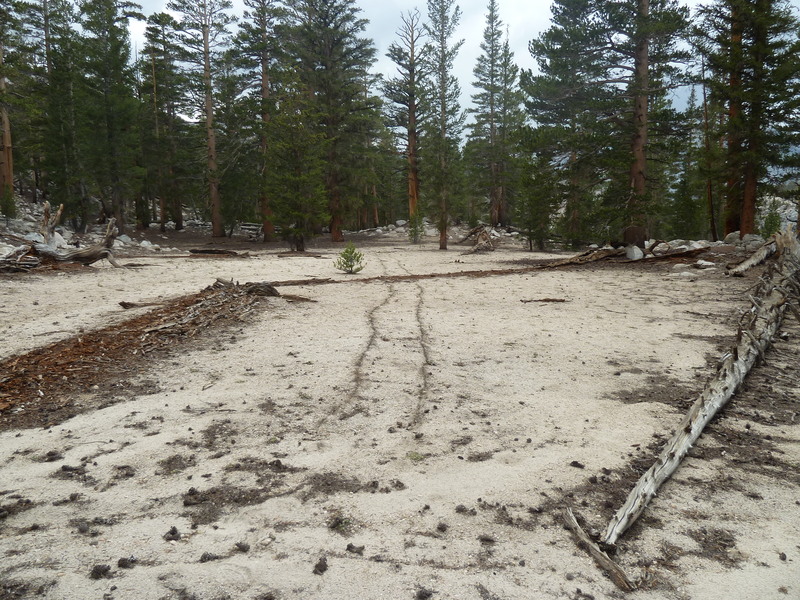 It is the old use trail that horse packers used to get to their camp. Below are pictures taken along the route. Click on each one to see the full-size version. 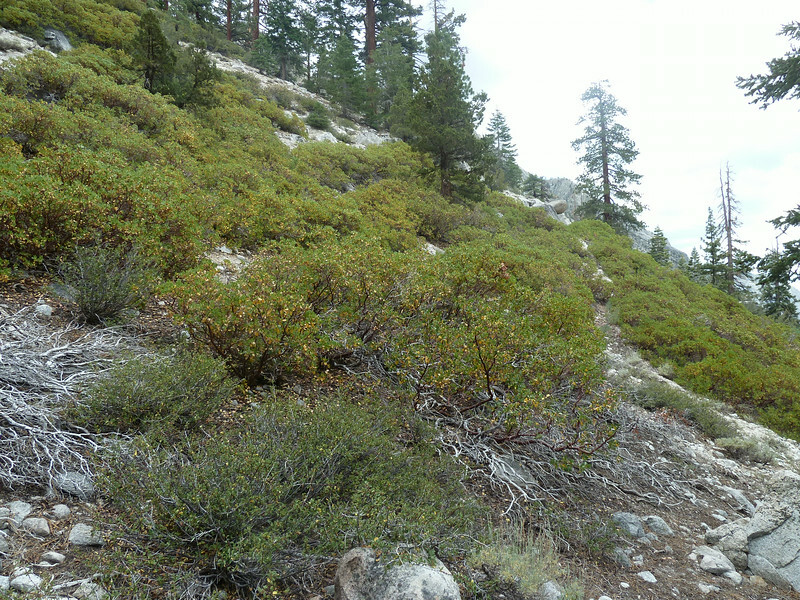 This is where I left the Kern River trail at Whitney Creek (a few yards south of the creek), and started up. 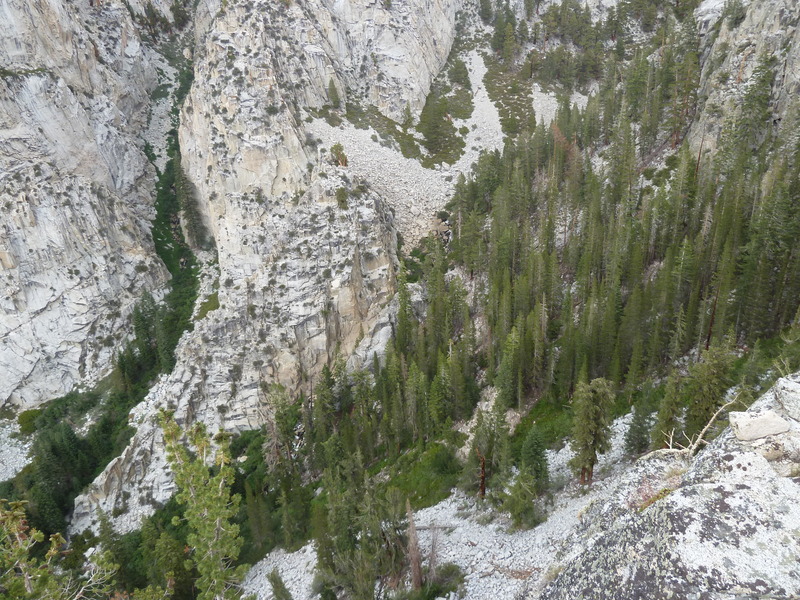 This is a crop of the above picture, showing the route I took through the steepest solid granite part. The granite knob had a weathered-out joint or crack that was easier to climb. 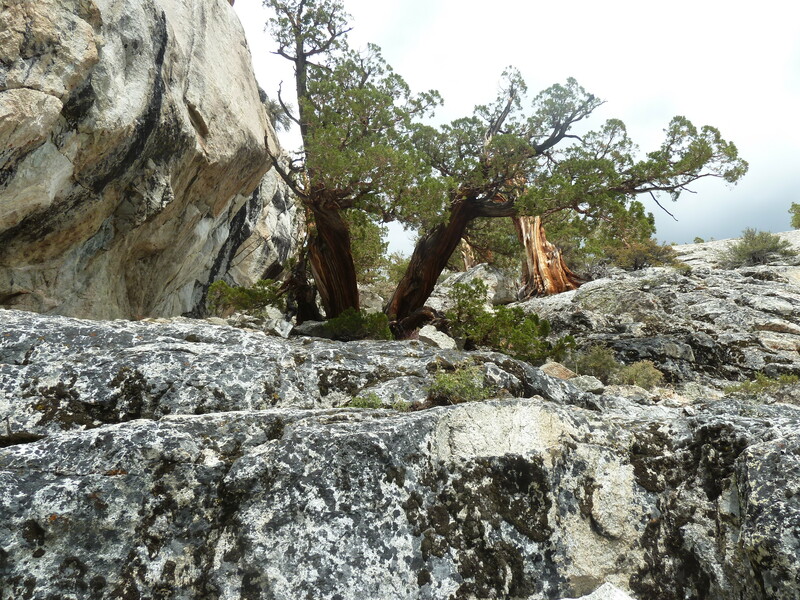 The section had a series of big, ancient juniper trees. The section required using my hands a little, but mostly used only hiking poles. Once at the top of the granite, it was open forest, where I climbed to a high point of granite -- a low knob, only about 10 feet higher than the surroundings. According to my SPOT record, it took 2 hours to reach the base of the ramp, and 30 minutes to get to the top. Then 1.5 hours to get to the packer camp. It was easy to find paths through the bushes, so not much "bushwhacking". The slope started up from the Kern gently, then increased to steep. More climbing, well above and just south of Whitney Creek. In the links above, George Durkee mentions an obvious gulley south of Whitney Creek. It may be the area on the right side of this picture. I took a more direct route, hidden by the trees just left of center. The slope eventually reaches a granite cliff area. I found the right side of this granite block had a nice blocky ramp, with a little class 3 climbing. These blocks and monster old Juniper trees were fun to climb. Only needed to use hands a few places. 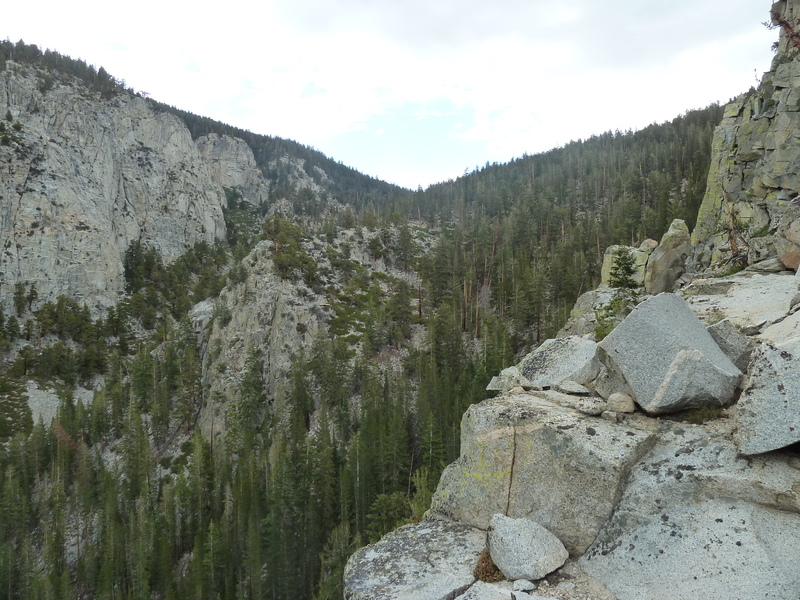 After climbing above the solid granite section, I moved over to the "edge" to have a look into the Whitney Creek canyon. I continued to the right again, staying out of the rugged areas in this view. Looking down from far above -- This shows Sandy Creek joining Whitney Creek. After climbing a granite knob, then descending only a few feet, I continued climbing, but the terrain became gentle, so followed the contours, heading a little north until Whitney Creek came into view. There were occasionally flat sandy sections. I found boot prints occasionally. ...and these "sand lines". At last, Whitney Creek. Here, I crossed to the north side, as the terrain was more open and gentle on that side. 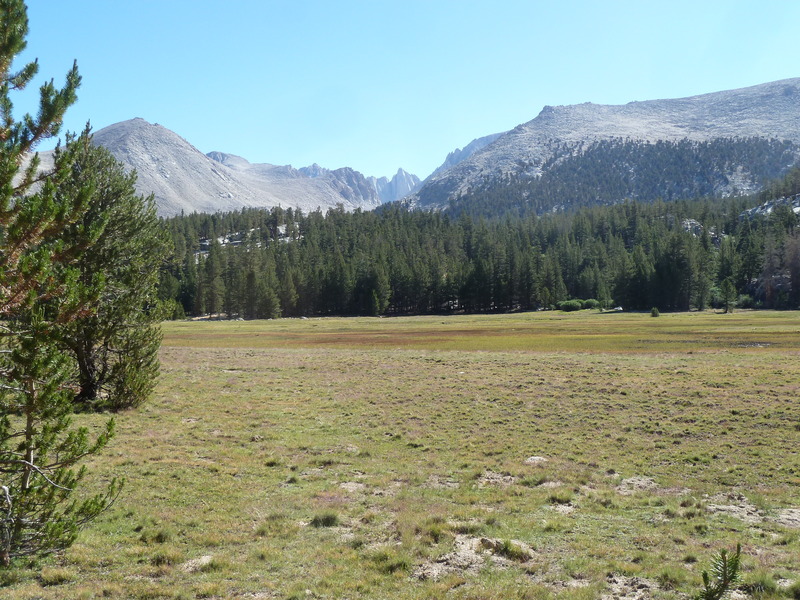 Lower Crabtree meadow, where I joined the PCT. First view of Mt Russell, just N of Mt Whitney. These are the GPS locations used to create the mapping tracks and G.Earth image. Those with the * correspond to my SPOT track points. Others are interpolated to better show the route. ...so don't try to follow the points exactly on a hike. They may be off by 10-20 feet, some maybe more! 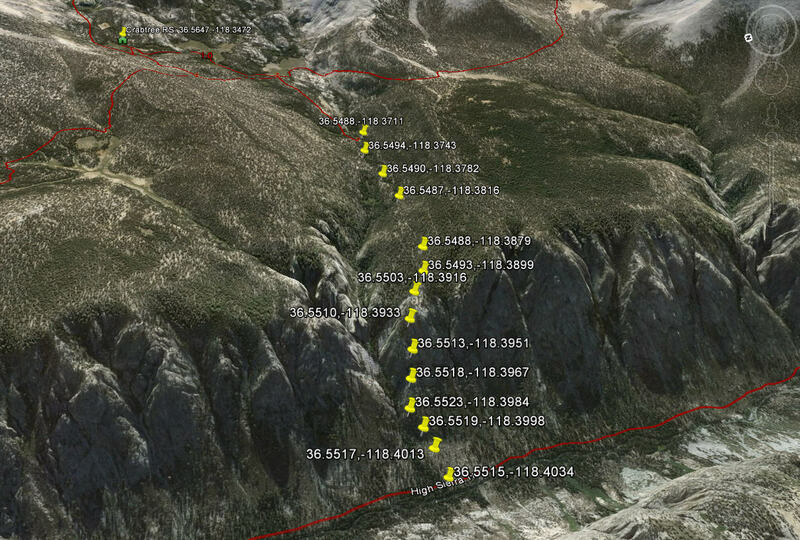 The first ten points are created from Google Earth and Gmap4 to identify the route from the PCT/Crabtree junction down to the packer camp. This map shows the route. It can be downloaded or printed. Click it to see the full-size map. Edit: In summer '16, I found the actual trail that connects the Packer Camp to the PCT. The gps points shown above are wrong. The old trail is more north, pretty closely follows that stream line. ...From the PCT: (This is half a mile south of where the JMT heads east towards Crabtree Ranger Station.) The PCT heading north crosses Whitney Creek, and then climbs a moderate incline for about 200 yards. Where this incline levels off (there are some old logs by the trail), there is a faint use trail heading west. Follow it west, it descends into a swail (gentle creek drainage), and it heads down to the packer camp. 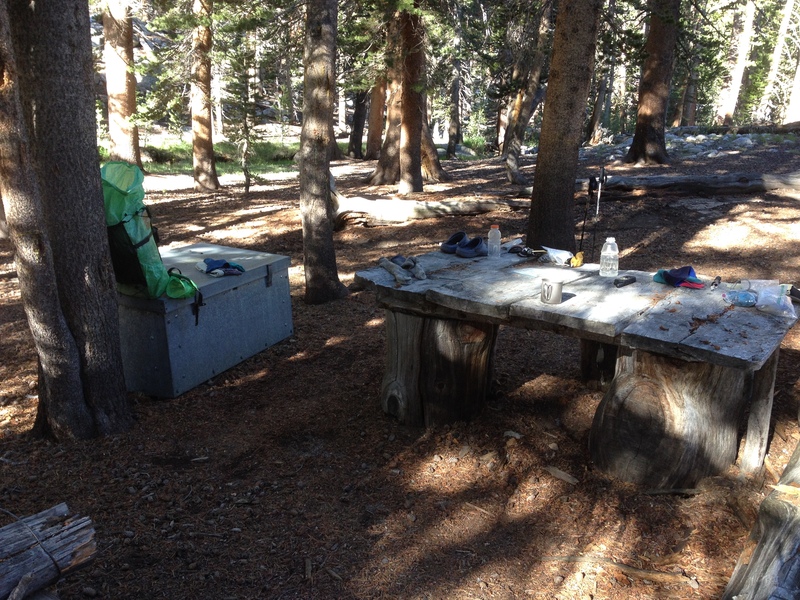 ...From the packer camp to the PCT: From the camp, head northwest through the trees to the grassy no-tree space. Cross that space to the trees to the northwest. 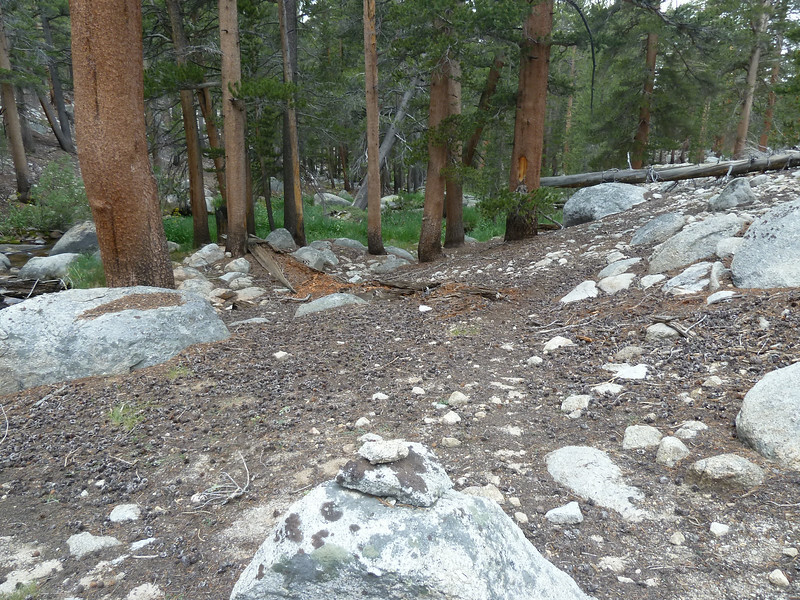 I found a constructed trail making a little switchback there where the trail begins to ascend the steeper slope. Follow it east-northeast to the point where it joins the PCT. Edit 2018: In 2016, I revisited the Packer Camp, and looked for a "warm spring" as mentioned by ranger Rob P. I found it, about 200 yards (5 minutes walk) west on the south side of Whitney Creek, up on a plateau. Unfortunately, it was covered by thick green "scum" or moss, and I spent half an hour clearing it away. As for "warm", it's chilly by swimming pool standards: about 70 F. So nothing like a truly nice hot spring -- those have to be 95 F or more. It's just warmer than Whitney Creek. But not really worth a special trip, unless you are already at the Packer Camp. Very nice job. That looks like a very interesting, remote, and adventuresome route. I'd love to see more pictures of the area, maybe I'll have to go and take them? It's also amazing how many "packer camps" exist out there in the forest. If you get just a little off the beaten path, it's amazing what you can find. If you get just a little off the beaten path, it's amazing what you can find. Here's a place near Reno we call Motel Hell 'cause it's hard to get there - lots of bush wacking,no trail, out in the middle of nowhere near Mt Rose. Since my bear can can hold 8 days of food and by day 6 our packs will be light, I think we can do the short cut you described in such detail. Depending on the day we may even skip the Jn Meadow and continue to Kern hot springs (all gentle down hill anyway) since it took me less than half a day from KHS to Jn Meadow this summer. If we save one day, I like to camp at CT meadow and explore the crab tree lakes you described in your x-country adventure as a day hike. I like to see your detailed description of your x-country short cut thru Crabtree lakes to Discovery pinnacle, trail crest. For me that could be too much adventure in one trip. But would be interesting to check it out part of the way! Jump in with your comments! Again thanks for paving a new adventure! Wanted to give this a bump. Steve, your excellent additions did not show up when I clicked back to the thread, which only showed the new post. glad I scrolled up! I'm strongly in favor of documentation of such things. It diverts a small, but significant, portion of the traffic off of heavily traveled routes, and everyone has a better time. Yes, I spent quite some time yesterday with Google Earth and Gmap4. First picture is now the G.E. view. I think the route is documented about as well as it can be. Now we need someone to go to the packer camp and find that spring and report back on the water temperature. It was cool finding the line for the old use trail on Google Earth's maps, and to include that in the map above. Steve, you just wrote the book on the shortcut. What more does one need? How about a partner at my age just to keep me on track, and safe. You youngsters!!!!! Very cool report. When I did the HST last year, I passed by this creek and it occurred to me what a nice short cut it would be to Crabtree. It looked doable on the map and in real time, and I thought to myself, "I bet the rangers do this all the time." But I don't do much off trail, and I was solo, so I did not explore. Very interesting to see how it works. I am surprised there is not more use trail in there. Thanks! yes, I remember the holy (hole-y) bucket:) at the KHS! 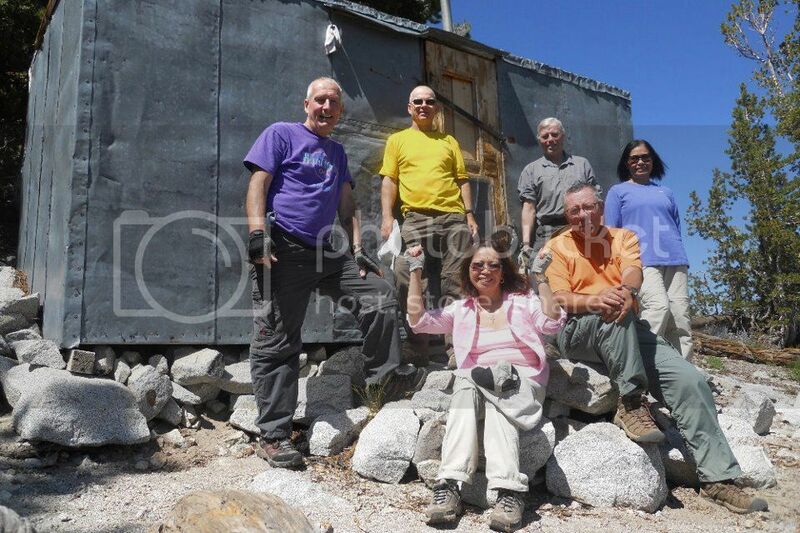 Actually the big family who camped there after you left, put a black garbage bag to keep the water. I do carry the REI 10 gallon shower bag (less than 10ozs) which I could have used. I like the lower pool better as its sandy and comfortably warm. Just waking up after wallowing in self-pity after a failed JMT this year in August. Luckily thanks to Yosemite SAR, got down to TM on a Ranger-led horse after a fall near Sunrise creek (hyper extended my left knee which triggered my old Arthritic pain ). Any way there was some interesting conversation going on JMT yahoo group where there was a suggestion to combine HST and JMT for a awesome experience of both. I did the JMT (2013) and HST (2014) and remembered your x-country adventure from Kern river to Crab tree meadow and posted your link there. I hope some one important would take this up with SEKI new trail projects and makes it real!!! That would be really nice and will definitely make me look forward to another exciting trek.